something. 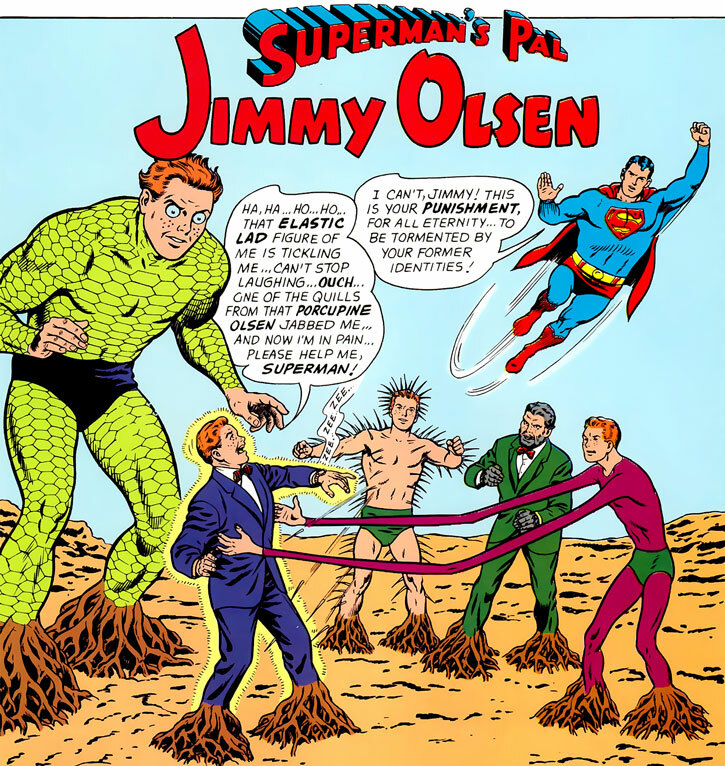 It covers the 163 issues of Superman’s Pal Jimmy Olsen, from 1954 to 1974. This material mostly takes place on pre-Crisis Earth-1. If the previous sentence was gobbledegook to you, see our article about the ages and Earths of DC Comics. It was a great, classic run of comics; campy stories of a human reporter in a world of wonder and superheroes. I’m amazed at the pure number of skills and common sense this young man has! This writeup primarily takes the first few dozens of issues into account. It doesn’t summarise the “storylines” in the book. Real Name: James Bartholomew Olsen. 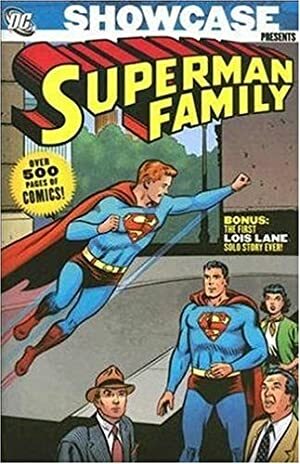 Other Aliases: Marco Polo (previous incarnation), Spartacus (previous incarnation), Flamebird – Hero of Kandor, Jimmy Wayne, Mr. Action, Kid Olsen, Metropolis Marble Champ, Crooner, Detective’s assistant, Elastic Lad, also see The Many Transformations of Jimmy Olsen special section. Known Relatives: Father (not named during those early issues). Group Affiliation: Nightwing & Flamebird, the Dynamic Duo of Kandor! Inc Aces Club member. And many more! Base Of Operations: Metropolis, Kandor or mobile. Height: 5’8” Weight: 140 lbs. Age: ~16-17. Jimmy is a very bright young man. He is capable of adopting quickly to any situation with a cool head. He has a superb amount of common sense and knows a lot of common and uncommon skills and learns new things on the fly. While a non-powered human, he has a lot of untapped heroic potential which comes to the front under the right circumstances, such as during his visits to Kandor. He would usually wield any temporary superpowers with great efficiency (Accuracy), even though disastrous side effects would sometimes also plague such powered forms. Jimmy knows how to spin information into a good story, which is why he regularly holds the front page news of the Daily Planet. Jimmy was taught fluent Kryptonese as well as knowledge of Kryptonian customs from advanced mind-tapes in Kandor. Giant Turtle Man (and Turtle Boy). In the Elseworld story The Nail Olsen would have his DNA altered into Kryptonian form. On Earth-2 he is known as Accountable, being a hyper-intelligent knowledge-assimilator. Olsen also had non-powered heroic identities such as Viking, “Beard Man”, Morbidly Obese, the Hippie and the legendary Flamebird of Kandor. In some forms he would display new abilities not otherwise shown by Jimmy, and we can assume such abilities are part of respective powered form. Jimmy’s many transformations are indeed quite legendary and these were also greatly homaged in Alan Moore’s Supreme books with the Olsen analogue Billy Friday (also see the Supremium Man writeup). 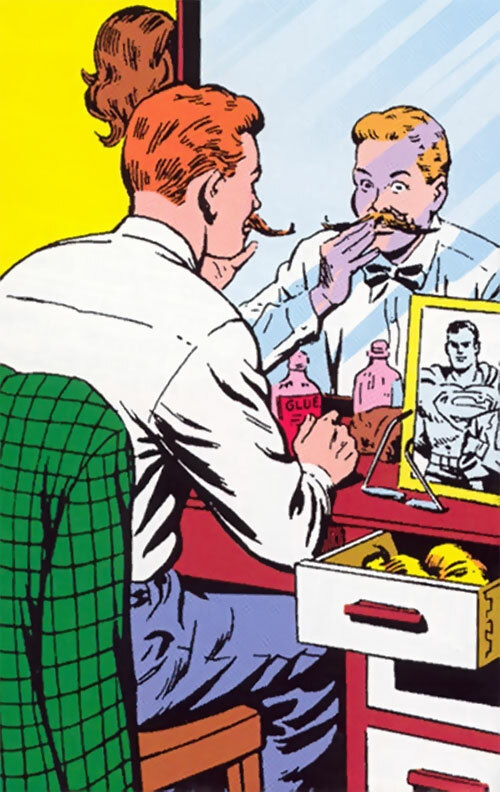 Naturally, Olsen features in many of the various Superman Elseworld stories as well. Jimmy Olsen is a character of great cultural importance pertaining to the Golden and Silver Age of Superman comics, and he has been parodied or given homage numerous times in various media! Jimmy Olsen is always adventuring to get a good scoop for the Daily Planet newspaper in Metropolis. 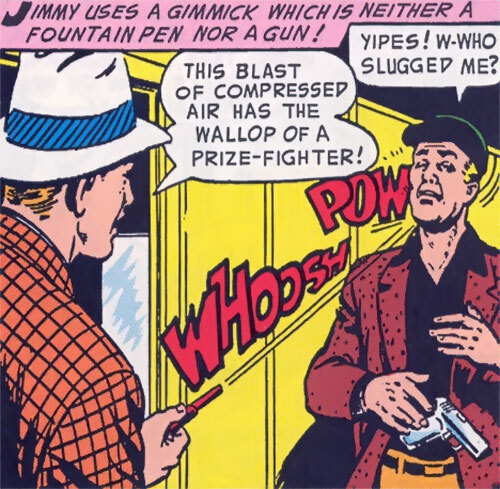 Jimmy is well known the world over as Superman’s pal, which has both its privileges and drawbacks. His activities often gets him into very dangerous situations, which sometimes require Superman’s help. Jimmy regularly meets criminal elements (he knows the Metropolis police files by heart), con-men and crackpot inventors. Jimmy has also traveled through time on numerous occasions and has had many adventures in other time eras (and he eventually became a Honorary member of the Legion of Super-Heroes of the 30th century). Through magical means he has also relived parts of his lives as a few of his earlier incarnations, namely Spartacus and Marco Polo! There is another part of Jimmy’s amazing life that few people know much about, namely his career as a Kandorian superhero! He regularly teams up with Superman as the masked crimefighters Flamebird and Nightwing, respectively, whenever they visit the Kryptonian bottle city of Kandor in Superman’s Fortress of Solitude. The scientist Nor-Kann, who was a friend of Superman’s father on Krytpton, provides them both with an advanced secret hideout to operate from. Jimmy Olsen is a young man in great shape and has very recognizable looks. He has trademark red hair and freckles, and often wears traditional, even outdated, sometimes striped, suits and a bow tie. In the field, he often wears clever disguise and he can thus be found wearing practically anything on different occasions. Jimmy is always in good mood and in excellent spirits. He is curious, dedicated and quite brilliant. He has a good heart and will always help his fellow men. One could say that adventuring is in his very soul. He is so impatient to get things done that he often forgets to spell-check his own writings, much to the dismay of his boss Perry White. His adventures are actually pretty far out and even insane, but he is very used to it all! The signal watch of Jimmy is important in his adventuring. By the simple twist of a control in his watch, a hyper-sonic signal will be broadcast which only Superman can hear anywhere on the Earth. Superman will then appear wherever Jimmy is in a matter of seconds. While Jimmy generally tries not to abuse the secret signal, to call for immediate help in dire situations, he does occasionally use it also for trivial purposes (which will result in a mildly amused Superman that stays for a few seconds only) or to call in the big guy to do some welfare work or other positive project (and of course Supes help out good causes too!). In fact, Superman does check up on Jimmy on occasion even without the signal watch having gone off, knowing full well what type of dangerous and unusual life Jimmy lives. 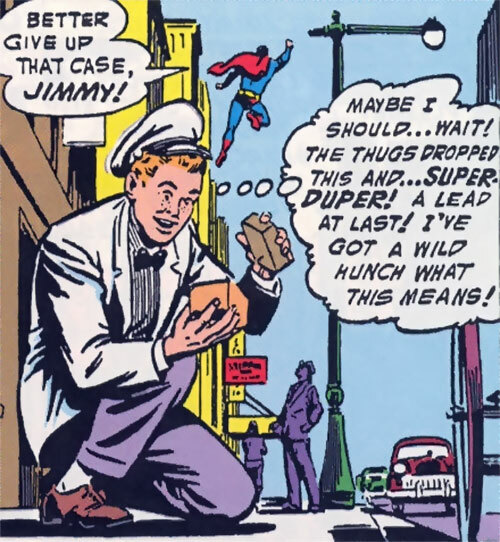 While keeping watch (so to speak), Superman stays completely unnoticed, and will only intervene if it appears as if Jimmy is in over his head in whatever adventure he’s involved in at the moment (it is sort of as if Jimmy also had the old Silent Assistant advantage). Naturally, Jimmy has excellent intuition and good hunches. He has a collection of Superman souvenirs and trophies and he knows the story behind every piece. He has great enthusiasm and always keeps his promises. He manages by on a small salary, and is actually not ready for a lot of money: he once received a million dollars and the riches immediately went to his head until he lost it all. He is no glory hound at all, and is a true friend of Superman, always valuing their friendship greatly. At work, he has great respect for his boss Perry White, he is friends in a professional way with Lois Lane and Clark Kent and privately has an on and off again girlfriend in Lois’s sister Lucy Lane. Credentials (Press Pass), Familiarity (Metropolis crime files, Kryptonian customs), Language (Kryptonese), Luck, Sharp Eye. Superman (High), Nor-Kann of Kandor, the keeper of the Nightwing and Flamebird hideout (High), Van-Zee of Kandor, aka. Nightwing II (High), The Daily Planet (Low), Professor Potter (High), The Legion of Super-Heroes (Low, later only, 30th century). Age (Young), Secret Identity (in Kandor only). Wrist Watch [BODY 02, Radio Communications: 20, Bonus: Scrambled, Limitation: Radio Communications is Broadcast signal only (-2), Note: The watch will broadcast a ultrasonic secret S.O.S. signal audible only by Superman activated by twisting a control, R#4]. Crime-Foiler fountain pen [BODY 01, Projectile Weapons (Ammo 01): 02, Chemical Attack: 02, Note: Chemical Attack represents tear gas only]. Elastic Lad potion [BODY 01, /DEX/ 08 /STR/ 03 /BODY/ 07, Acrobatics: 05, Stretching: 08, Note: this amazing drink, similar to Elongated Man’s Gingold drink, gave him the elastic powers that helped him gain membership into the Legion of Super-Heroes. The exact duration of the potion is unrevealed.]. Lead Cloth Cap [BODY 01, Mind Blank: 05, R#2, Note: This is kept in the Utility Belt and must be worn on the head to function.]. Torch [BODY 01, Laser beam: 05, R#2, Note: the torch gets its energy from the personal jet-motor of the Utility Belt]. A small pellet of Green Kryptonite. Elastic slingshot [BODY 01, STR 00, Bonus: Enhances the throwing Range of the user for small objects by one AP up to a maximum possible of 5 APs]. Likely also other objects that can be handled as Trinkets or Omni-Gadgets. 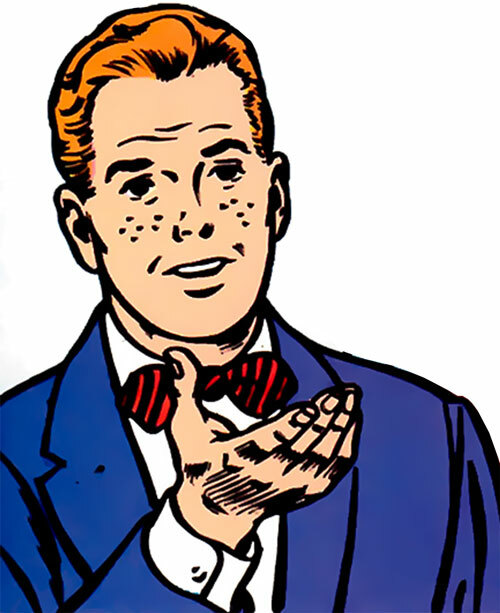 Source of Character: Superman’s Pal Jimmy Olsen #1-163 (1954-1974), DC Comics. Writeup completed on the 16th of February, 2016.